Located just south of Shore Acres State Park but technically within Cape Arago State Park, this wayside is easy to miss as you move between these incredible destinations. Though well-dressed with new interpretive signs and fresh guard railings, the site appears as a modest turn-out with an excellent Pacific view. Lower you windows, however, and you’ll hear another part of the story. The barking, groaning, and baying from literally thousands of pinnipeds rolls round through the onshore winds that buffet this outlook, daring you to find visual evidence of the source of the impossible sound. An abundant quantity of sea mammals and birds congregate on Shell Island, the largest of the rock resting spots, and Simpson Reef, the long line of sandstone formations just behind it. Look for cormorants, murres, and puffins outlined on ridges, or try to spot petrels and terns in the air. 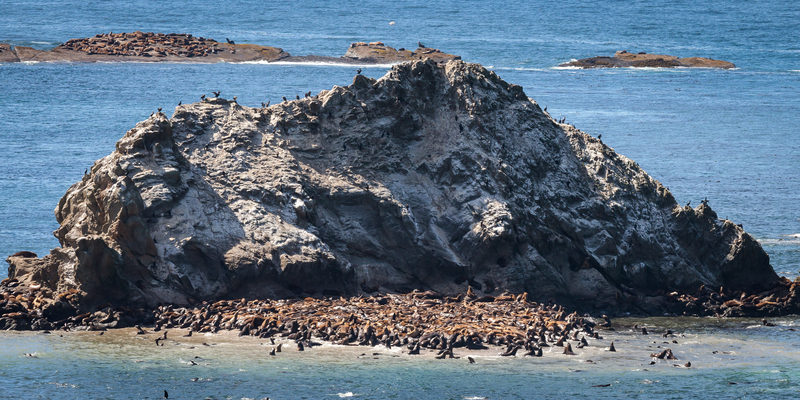 Given the density and color of the seals and sea lions closer to the water, the congregation may be mistaken for the rock itself. And don’t be surprised to see the spout from a passing gray whale farther out to sea, as well. Bring binoculars or a high-powered telephoto lens for a closer perspective, as the rocks are about a quarter-mile off shore. Because both Shell Island and Simpson Reef are part of Oregon Islands National Wildlife Refuge, going to the islands is prohibited, and watercraft must maintain a minimum distance of 500 feet. Short of a chartered cruise, the Simpson Reef Overlook is one of the best views you’ll get of this protected place.